Rockwell is proving once again that they are a major player in the oscillation tool market, this time by coming out with a new feature that no other oscillation tool has. Improving on the already great Rockwell F50 Sonicrafter (read the review), the new F80 adds the game-changing new Duotech feature. Every time I write an article or review on oscillating multi-tools I mention the oscillation angle the tool provides. Cutting is not just about speed or power, but also about how big of an oscillation angle the tool provides. While some brands have a relatively small oscillation angle, Rockwell has always been pushing the limits. With the new Rockwell F80 Duotech Oscillation Sonicrafter, they are pushing things even further; this time by providing an option for users to switch between either a 3.4-degree or 5.0-degree oscillating angle on the tool. Increasing the oscillating angle of the tool increases the efficiency during cutting, sanding and even scraping, but it's not perfect in every situation; which is why it is great that users will now be able to choose which angle is best suited for the task at hand. For detail work, where accuracy and control are needed, the smaller oscillation angle will be welcomed. Like the F50 before it, the Rockwell F80 Sonicrafter uses a counterweight, to offset the vibrations the larger 5.0-degree oscillations produce, which also aids in control. 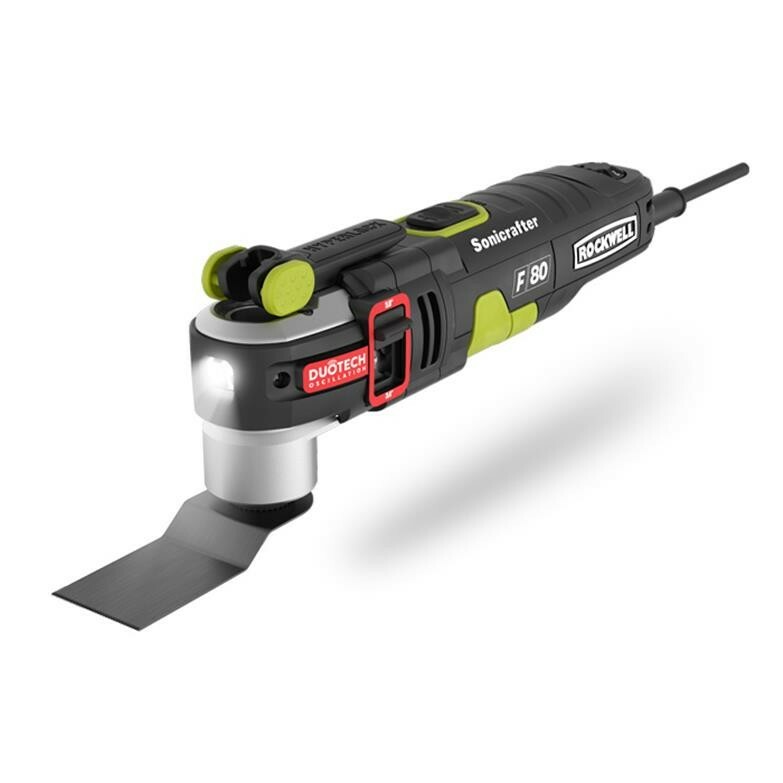 Other features from the F50 like, the Universal Fit accessory system and the Hyperlock tool-less blade change system also appear on the new F80. While the F80 does have a slightly slower OPM compared to the F50—10,000-19,000 verses 11,000-20,000—it does offer a larger 4.2 amp motor that incorporates an electronic constant speed control that maintains the tool’s cut-rate under load. Overall, the Rockwell F80 Duotech Oscillation Sonicrafter (RK5151K) looks to me a nice upgrade from the F50, and with a listed price of $159, it doesn't break the bank. The RK5151K kit will include 10 Universal Fit accessories: (3) 1-3/8” end-cut blades, (1) metal, (1) precision, (1) standard), (1) 3-1/8” HSS semicircle saw blade, (1) plunge & saw blade, (1) flex scraper blade, (1) sanding pad, (3) sanding sheets, plus hard case that houses the tool and accessories. Look for the F80 Sonicrafter RK5151K kit at Lowe's and at RockwellTools June 2016.